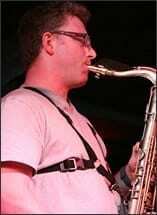 Saxophonist / composer Dan Stern started off on the clarinet, before moving on to the tenor saxophone when he started studying with master musician Dave Liebman in the US. Composition has always been at the heart of his approach to music making. His debut album, ‘Traces’, was the consequence of a suggestion by Tim Garland to write an extended piece of music. The resulting suite attracted eminent musicians such as David Liebman, David Binney, Tim Garland, Phil Markowitz and Gwilym Simcock to record with him. Prior to this, Dan had built up a solid foundation in classical music, reading Music at Cambridge University, and studying composition with Alexander Goehr, Robin Holloway, and Malcolm Singer. His conception of contemporary jazz music has evolved from this typically European background. Dan also sees the modern in his presentation of ancient music: in his ‘Traces’ album he created a type of medieval mash-up, using twelfth centruy composer Perotin and sixteenth century composer Palestrina as the basis for extended compositions and improvisations. This is especially interesting to witness live, where Dan uses loop-based technology to create an enchanting sound world that fluently travels between Renaissance polyphony and post-Coltrane saxophony. His current band features some of London’s finest jazz talent: Robert Mitchell (piano), Julian Siegel (reeds), Tom Mason (bass), and Asaf Sirkis (drums). The band plays with intensity and passion, and yet is also able to pick ou the detail of Dan’s complex yet accessible music.